Adult Dosage: Drink 4 ounces twice a day for 3 days then 8 ounces twice a day. Some may require 4-8 ounces midday due to lack of bowel tone. If you have a sensitive large intestine, you may want to start with the 4 ounces twice a day and work up slowly and gradually to the 8 ounces twice a day. 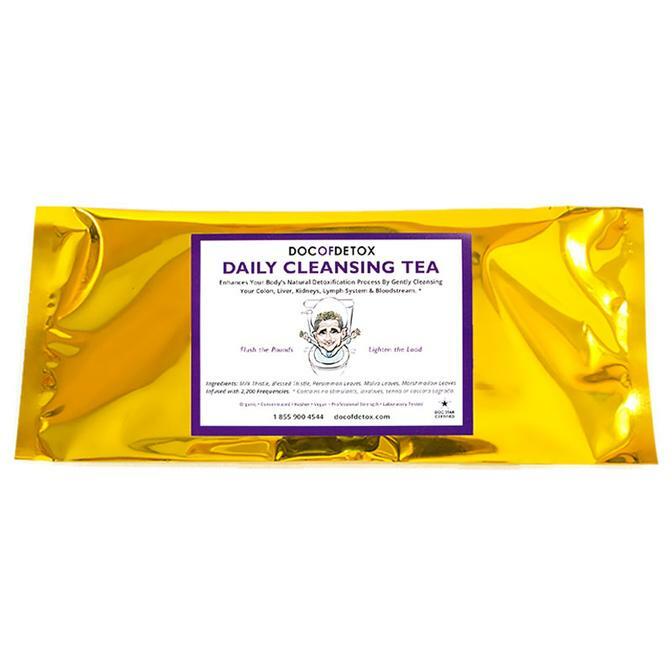 Daily Cleansing Tea is touted as ‘North America’s Top Selling Whole Body Detox Cleanse’ and contains no stimulants, caffeine, cascara, or senna. It is an organic formulation that encourages full-body and digestive tract cleansing. Each tea bag contains a specially formulated combination of premium quality, all-natural organic herbs including blessed thistle, milk thistle, malva, persimmon, marshmallow leaves. Most people avoid typical detoxes because they worry about bowel urgency – that they will constantly be running to the bathroom. This tea works on a deeper level, purifying all of the body’s tissues and organs. Starting in your large intestine, it addresses toxins in the body and also helps to prevent toxic buildup. This tea has also been infused with vibrational frequencies for added health benefits. Regular use of this product can help relieve aches and pains, increase energy and sexual drive, and help those looking to lose weight. Caution: If you are pregnant or have had major surgery in the large intestine within the last 12 weeks or have any health concerns, please consult a health practitioner. The dosage provided is recommended for adults only. Never microwave this product. “I have used multiple detox, cleansing and purifying products over the years and this is a joy to use. It is simple, easy, relatively inexpensive and above all, effective. Rather than going through a few days once, twice or more times a year, this is a gentle daily cleanse which is much easier on your body than these aggressive weekend or week-long cleanses that in themselves can make you feel stressed and inclined not to even bother. Improves digestion, bowel function, urinary/bladder release and is a great slimming tea. Easy yet effective is good…very good!” David Sloan, PhD, NNCP, RNT. Clinic Director – Sloan Natural Health Center. The information and Product Descriptions appearing on this website are for information purposes only, and are not intended to provide or replace medical advice to individuals from a qualified healthcare professional. Consult with your physician if you have any health concerns, and before initiating any new diet, exercise, supplement, or other lifestyle changes.